A Southern Grace: disaster averted! I cringe to think of all the pans and platters and molds of baked goods that wind up in the trash can because they didn't turn out exactly right. If one really takes a moment to collect herself after this initial failure, chances are good that she'll find a way to redeem herself, her food, and her kitchen prowess. I definitely needed more than a moment to gather my wits after this episode of baking trauma. I made some pecan pie bars (a tried, true, and well-reviewed recipe, mind you), foolishly substituting a caramel sauce for thicker, sturdier corn syrup. As you can well imagine, the pan I pulled out of the oven was a sloppy mess. What to do, what to do? Throwing them away didn't even cross my mind--those pecans are expensive, darn it! My rescue plan involved making a simple and straightforward yellow cake and scattering blobs of the failed pecan pie bars throughout. It worked like a charm, I'm happy to report. Granted, the dollops of goo promptly sunk to the bottom of the cake and remained there, but that just made them a nice surprise not visible before digging in. To make the crust, beat the flour, butter, and brown sugar in small mixer bowl until crumbly. Press into prepared baking pan and bake for 12 to 15 minutes or until lightly browned. To make the filling, beat the eggs, corn syrup, sugar, butter, and vanilla extract in medium bowl with a whisk. Stir in the chips and nuts and pour evenly over the baked crust. Bake for 25 to 30 minutes or until set. Cool in pan on wire rack. Cut into bars. Should bars be an impossible dream, mix up the cake as instructed, pour the batter into a 9 x 13-inch pan, and plop the hunks of pecan pie goo here, there, and everywhere. Bake as directed. I always try to recuperate everything... That is a great idea. Yummy! Ingenious! How cool are you, rescuing those poor pecan bars? Good thinking! I usually try to save my kitchen disasters in some fashion, but this was a very thoughtful move. Those gooey dollops look delish. Great save! The cake looks fab! I just had a similar disaster so I can relate. sometimes the best desserts come out of mistakes, or failures...the only problem is when everyone loves it, you have to be able to recreate it! been there too often...lol..
but your cake looks incredible!! Well done on the rescue! Oh man, I hate it when I have failures. But this is a great save Grace and I love the looks of this goo filled cake! Really, you can't throw out pecans; you really had your thinking cap on for this. Great job! Righto, perfectly good caramel and pecans just cannot go to waste. Nice save. Gasp! I'm so glad you didn't throw away your pan---great save. Who said, "Necessity is the mother of all invention?" Was it Benjamin Franklin, Thomas Jefferson? They were right on the money! You are brilliant! I would have just eaten the messy bars with a spoon. Nice save indeed. I never would have thought of it! Seriously brilliant idea! I never would have thought to do that but I would have been sick about the wasted (pricey) pecans! You are amazing. You are so funny, Grace! I probably would have eaten that gooey mess (which actually sounded pretty good) with some ice cream and called it a day! Good for you for making a successful lemonade out of your failed lemon! Absolutely brilliant, Grace. They say necessity is the mother of invention, right? :) This looks delicious! How did we ever get the gazillion recipes that now exist for us to refer to? What a very creative idea! That never would have crossed my mind; I tend to get frustrated very easily when I have a flop. One good thing is that I have a teenage son so not much ends up in the trash! Grace you are too clever! I'm so impressed! Sometimes I use "flop cakes" in trifles but this is advanced salvagery! How brilliant! I would have never thought of that! It looks like it worked out perfectly! NIce save. Way to make lemonade out of lemons...err cake out of failed pecan pie bars! This looks absolutely delicious...possibly more so than the original! Well done! Looks and sounds amazing! Fabulous idea and way to save a "fail"! I do that all the time too, attempt to redeem a flop but tell no one what the original masterpiece was supposed to be! You deserve a big pat on your back! It in no way looks disastrous. As a matter of fact it looks pretty darn tasty! I hate to think of how many things I've thrown away over the years... this is a brilliant idea! What a sucess story! This sounds seriously delicious. I think I would flip it around and pick at the pecans even completely full! Ahh, the mark of a smart girl and cook! The sign of a good cook! Love your quick thinking to avoid waste, and these look really delicious. One of the most beloved and frustrating things to me about baking is that it really can be a delicate science. Things are bound to be off some time or another, so it's great to be able to make the best of it. I would probably use a caramel sauce instead....;-) thanks for sharing the practical rescue tip! Nice save. Pecans are absurdly pricy - as are most nuts - and who would want to throw them out anyway? Nice save! This definitely elevates cake to a whole new level! Nice save! This looks delicious. I'm like you, it pains me to throw away any form of food. I love when you can get it a second life and you succeeded nicely. Good work! I agree with everyone else. Nice save!! Nice recovery baby cakes! Where is there a photo of you so I can see who I am talking to!!!! Well said Grace. Very true abt the pinch we go through with desserts reaching the trash can. Ur cake looks awesome! I need you to come to my house and fix some of my failures! Whoa--nice fix! I don't think I'd have thought of that one! I would have just eaten the gloppy bars with a spoon. Cake is so much better! See, I would have pitched it, pitched a fit, pouted and demanded someone make me something tasty. Yum yum. I can't think of anything I'd like more than a pecan pie cake bar! I adore pecan pie. You displayed the traits of a great baker by getting creative with the treats that did not quite turn out as planned. This looks wonderful. I would be all over that pecan bar cake. Beautiful. I love bar treats, including this one! I usually try to save my failed attempts also, but recently had to throw out pie dough that just wasn't right. It hurt as I watched dollars go down the drain. Great save! I must live with a pack of wild dogs. They eat everything, disaster or not, all the while telling me how to improve on my next attempt. Excellent save! I am like you -- I hate wasting ingredients (especially expensive ones). I would never be able to throw out pecan anything. 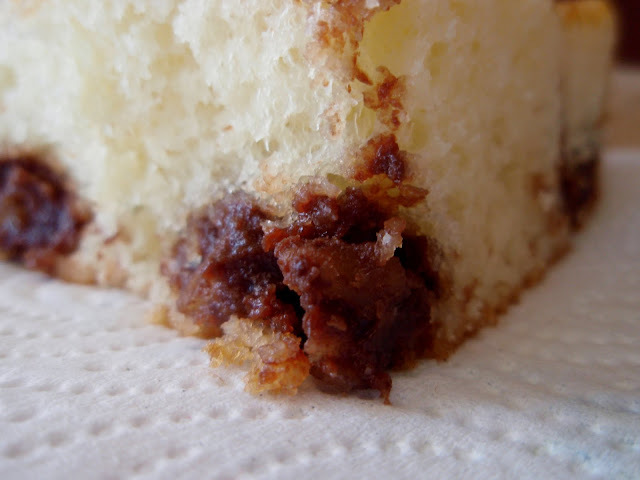 Your Pecan Pie Bar Cake looks absolutely stunning. And to think, I missed National Pecan Pie Day on the 12th! I sure could have used a few dollops of goo. Good job!! Must save those pecans!!! 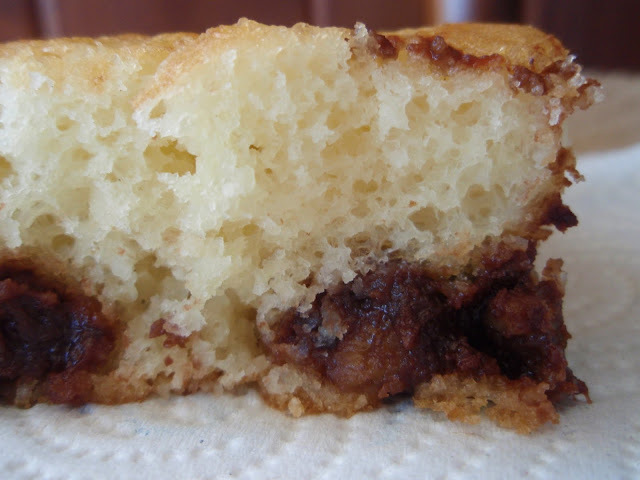 This looks like the best mistake cake I've ever seen - really, how can you go wrong with hidden blops of pecan? I usually just make cake soup when a cake goes bad. This sounds much more interesting. Good save! I always dread screwing up a recipe full of expensive ingredients - have done all sorts of acrobatics in the kitchen to make sure I am still eat the result of a failed experiment. This sounds yummy! Pecans is all I can say! Oh yes, yummy! Haha I would love the goo surprise at the bottom :) Looks delicious to me!